Home Sales in February Drop - Will It Continue? Buying a condo in Boston? Get ready to pay big bucks. As of today, the average list price for a condo in Boston is $1,042,002, 13% higher than condo prices in Boston last March. Out of 444 condos on the market right now, only 47% of them are priced below $500,000. This is a big change from a few years ago. In 2010, 63% of condos for sale in Boston were under $500,000. Back then there were over 500 condos on the market priced under $300,000. Today there are just 101 condos on for sale in the entire city under $300,000. Why the jump in prices? Low inventory of homes continues to push prices for homes up across the region. Although new construction is taking place in Boston, it’s not enough to keep up with demand. There is a 17% drop in condos on the market this month compared to March 2013. As you can see in the chart below, when we look at inventory from 2010 to now, the total number of condos on the market has decreased and, as a result, average list prices have gone way up. Of all the neighborhoods in Boston, the Back Bay has the highest number of condos on the market: 67 condos are on the market, with an average list price of 2.4 million dollars. The majority of Boston neighborhoods are showing fewer homes on the market this year compared to last year. There are a few neighborhoods, however, that are showing an increase in condos on the market, and the average list price for them is well under $1 million. The North End is seeing a 40% increase in condos for sale compared to last year and the average list price is $669,842. Roslindale shows a 21% increase in condos for sale, and has an average list price of $283,308. East Boston has 18 condos for sale, an increase of 38% compared to last March. 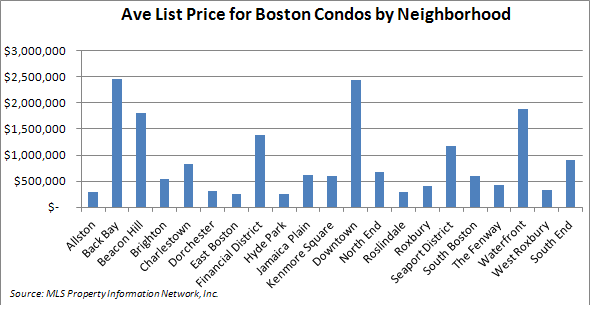 The average list price for a condo in East Boston is $255,764. And South Boston has the second most condos on the market: there are 44 condos for sale in South Boston, 19% more than last March and 9 of these condos are new construction. A condo in South Boston lists for an average of $605,347. Although there is an increase in the number of homes on the market for these neighborhoods, the days on market for these condos is very short: condos in Allston sell in average of 29 days; condos in Kenmore Square are only on the market an average of 11 days, and condos in Hyde Park sell, on average, in just 6 days. This means home buyers must move fast and be prepared to make an offer as soon as they decide they like the home. Because of the shortage of homes on the market, year to date home sales in Boston for all types of homes (condos, single-family, and multi-family) are down 6%, according to MLS Property Information Network (MLSPIN). Year to date there were 758 homes sold compared to 809 sold during the same period last year. Home sales in Boston for the same time period last year actually showed a gain compared to the same period in 2012 because there was more inventory. The average selling price for a home (condos, single-family, and multi-family) in Boston this year to date is now $717,523, an increase of 13% compared to the same period last year, when average selling prices were $634,536. There are some upcoming new construction projects that will help to ease the inventory shortage in Boston. The Seaport District is expected to see a 14-story luxury residential tower built with 118-units. Carpenter & Co. will break ground this year on One Dalton, a $700 million development in the Back Bay. There is also word that the developers of an apartment complex project in Charlestown have recently filed a request with the city to change the project from apartments to condos. This combination of fewer homes on the market and more buyers is a recipe for multiple offers on homes and condos, which can trigger bidding wars. So how can you buy avoid a bidding war and get the home you want? One of the first steps you should take when buying a home is to hire an experienced buyer’s agent who can show you homes as soon as they go on the market. This way you can see the home as soon as possible and move fast if you want to make an offer. Your agent will also help you prepare for the home buying process and provide you with all the data and analysis you need to compare properties and arrive at the right price that works within your budget.